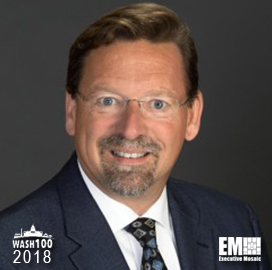 Executive Mosaic is honored to introduce Chris Marzilli, president of General Dynamics‘ mission systems business, as an inductee into the 2018 edition of the Wash100 — Executive Mosaic’s annual selection of influential leaders in the government contracting arena — for his ability to deliver mission support while maintaining operational excellence for U.S. military customers. Marzilli currently leads General Dynamics Mission Systems, which was formed through the integration of General Dynamics’ C4 systems and advanced information systems divisions. He was appointed to his current role after serving as president of the C4 systems business. The business unit secured a $125.6 million follow-on contract from the U.S. Coast Guard in October 2016 to deliver program management, sustainment engineering, system support and maintenance for the agency’s Rescue 21 search and rescue program. “Rescue 21 Coastal has been a game changer in transforming how the Coast Guard conducts SAR operations,” said Marzilli. Recently, he noted the U.S. Coast Guard has conducted approximately 100,000 SAR operations since 2006 with support from the program. Executive Mosaic congratulates Chris Marzilli and the GDMS team for their selection to receive this award.